Four Centuries of Jewish Women’s Spirituality is the first book-length exploration of Jewish spirituality as seen through the eyes of women. 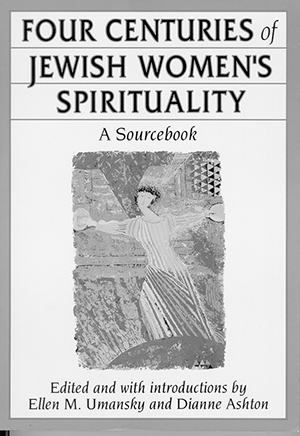 Drawing on archival material that has not been available to the contemporary reader, as well as new pieces written specifically for this volume, Ellen M. Umansky and Dianne Ashton have woven together a multiplicity of international voices, revealing the great variety of spiritual paths that modern Jewish women have taken. Contributors include Rebecca Gratz and Emma Lazarus, Amy Eilberg, Marcia Falk, Blu Greenberg, Kadya Molodowsky, and Judith Plaskow, among many others.